The city is moving forward on construction on key segments, but major gaps remain. Talk about a pre-emptive victory lap. The city lacks the cash and has no timeline for completing the East River Greenway, officials admitted yesterday. The de Blasio administration and the Economic Development Corporation issued a report claiming they have a path forward for the Manhattan Waterfront Greenway, a bicycle and pedestrian path encircling the island first envisioned when David Dinkins was mayor [PDF]. But while some media outlets spun the report as a step forward, nothing has actually changed: The gaps in the greenway that were unaddressed before the report’s release remain unaddressed today. This winter, construction will begin on the $100-million “East Midtown Greenway” between 53rd Street and 61st Street, to be completed by 2022. Three other segments are also in the pipeline: Inwood Hill Park to Sherman Creek, set begin work in 2021 and cost $41 million; East 125th Street to East 132nd Street, set to begin in 2021 and cost $101 million; and the $5 million renovation of the Harlem Lane Playground, which will wrap up construction in 2021. That leaves 28 blocks without a clear plan forward: the United Nations Esplanade between 41st Street and 53rd Street, and uptown segments between 145th Street and 150th Street and 154th Street and 163rd Street. The unfunded gaps render that East Side of the greenway far less useful than its western counterpart, which has been completely seamless for a decade. The EDC report does contain one piece of exciting news: the city now plans to upgrade the harrowing bottleneck alongside the FDR Driver between 13th Street and 15th Street, a proposal originated by Comptroller Scott Stringer when he was Manhattan borough president. 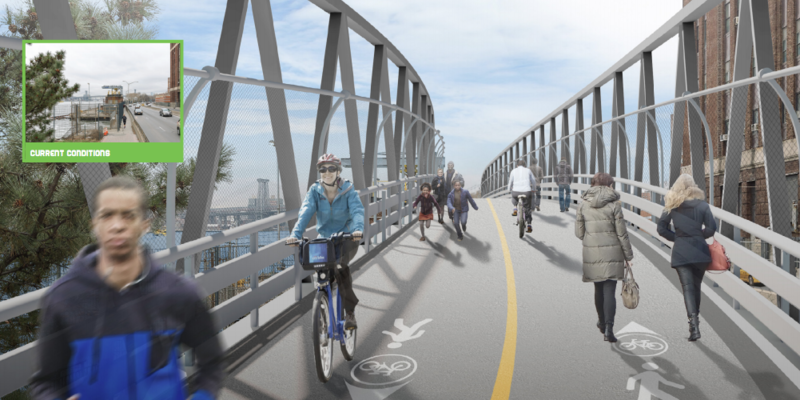 Renderings in the report show a bridge over the existing path, but the proposal has neither a timeline nor funding. Those improvements won’t come in time, however, for the L train shutdown, when the area is expected to see an influx of pedestrians and cyclists coming on and off ferries to and from Brooklyn. Anyone have a PDF on what’s happening at the Triboro/FDR right now. I know that the ramps were replaced, the highway was shifted, and a flyover was created, but how much work is left before that project is finished? That project is the biggest delay when it comes to finishing the Willis Ave Bridge connection to the greenway. It’s also a headache in general. I think it’s one of the most disruptive highway projects in NYC right now. Hopefully they widen some of these designs and provide clearly designed, separated and adjacent walking and cycling paths at all these locations when they finally do get funding. I’m as disappointed as anyone by the glacial progress but I think De Blasio deserves credit here for putting $250M towards some big gaps, even if some of that cost is shoring up the seawall which should really be allocated to the FDR. I doubt the modern west side sections cost as much due to the easier terrain. I look at the present announcement as a call for support for the east side path. The designs for the midtown sections where bike traffic will be heaviest clearly have separate bike and pedestrian paths like the west side greenway, so the big picture is right. The biggest open issues I see are the UN gap and the other existing mediocre sections, like that between 14th and 23rd adjacent to the overly generous FDR onramp. “The city lacks the cash” after the biggest economic boom here since the 1920s. Don’t forget the $4.5 Billion for biggest luxury mall in the world: Hudson Yards. Correct. They were using it as a staging area for the replacement of the Third Avenue Bridge (which I think was completed in 2004), then they were using it as a staging area for the replacement of the Willis Avenue Bridge, which was completed in 2016. Now they’re using it as a staging area for the Harlem River Drive Flyover Project. 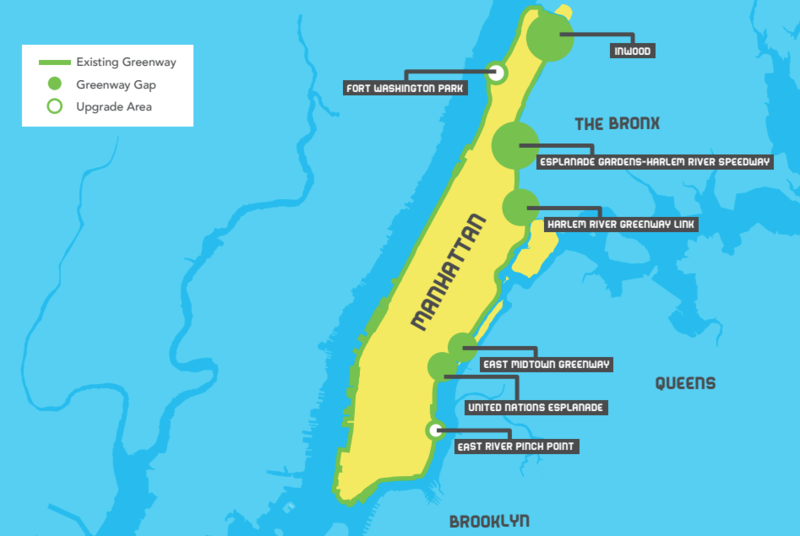 The Dept of City Planning’s Manhattan Waterfront Greenway section had this to say about the area about 10 years ago in an earlier report which has been removed: “After the DOT bridge reconstruction is complete, both DSNY and DOT have agreed to cede their land to the Department of Parks & Recreation, which will then turn it into a waterfront park, complete with greenway. DPR expects the Harlem River Park system to be complete by 2018.” It’s 2018 now and the City is now saying construction will begin in 2021. So, yeah, this is taking a while. Thanks for the follow-up and historic details. I’m a regular at that 13th-15th bottleneck. IMO harrowing is an exaggeration. It is more of an annoyance than anything else, where everyone has to basically turn sideways and shimmy across like traversing the face of a cliff or something. I suppose there is always the potential for a vehicle-related catastrophe on the adjacent roadway. I am so accustomed to it all but yes, it is one of the worst pieces of infrastructure imaginable. I will probably break down in tears if they ever build a bridge there. As for the entire East greenway project, that is so disappointing. I get bummed out every time I pass through that whole UN area. An unbroken East River greenway running along the entire East side would very easily trump the Hudson greenway. What an albatross the United Nations is to us.